Rose Apple is a popular fruit grows in Southeast Asia. Its scientific name, Syzygium Jambos, is a funny one. Rose Apples are crisp and juicy. It is rose scented and light weighted. Rose Apple trees are easy to grow and adds to the shade in the lawn. In the ancient times India was referred to Jambudvipa. It is a Sanskrit term, which means the Land of Rose Apple ( jambud- Rose Apple, vipa- Land). So this tree has an important tie with the history of India. In Sri Buddha’s story also the Rose Apple tree appears as a tree of enlightenment. So Rose Apple has a vivid history to show off. Now, our point lies on the fruit. Rose Apple fruits have a rose water flavour in it. Since they are hollow, rose Apples are light in weight. It is easily available in India. But how many of us know about its uses. Well, let’s begin with the edible side of Rose Apple fruits. 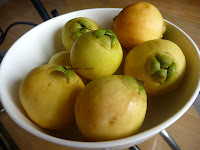 It is a favourite fruit item of children in India. It is an easily available and zero expensive fruit. People preserve Rose Apples and also use them to prepare jams and jellies. Rose Apple is also used to make desserts. It can be used to prepare fruit syrup or sauce. Rose Apple is regarded as a tonic for the brain and liver in India. 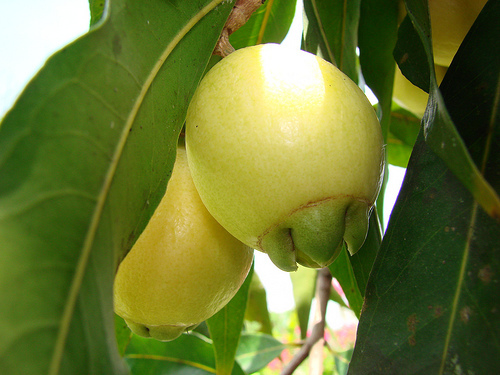 In India, the fruit is regarded as a tonic for the brain and liver. A distillation of the fruit acts as a diuretic. A sweetened preparation of the flowers is believed to reduce fever. The leaf decoction is applied to sore eyes, also serves as a diuretic and expectorant and treatment for rheumatism. The seeds are used against diarrhoea, dysentery and catarrh. In Nicaragua, it has been claimed that an infusion of roasted, powdered seeds is useful to diabetics. In Colombia, they claim that the Rose Apple seeds have an anaesthetic property. Cuban people believe that the root is an effective remedy for epilepsy. However, according to scientific research, both the seeds and the root are toxic and should be used with a caution. Fruit extract can be used to make a sweet smelling rose water. The ripe fruits, with seeds removed, could be distilled to make a "rosewater" equal to the best obtained from rose petals. Yellow oil, distilled from the leaves, used in the perfume industry. The flowers are a rich source of nectar for honeybees. Nokia Lumia 920- Why a Must Buy ?